Remittances constitute a critical lifeline for around 1 billion people around the world. These vital flows of private money, sent by over 200 million international migrant workers, help families raise their living standards and contribute to improved health, education and housing. Remittances also make it possible for recipients to be more entrepreneurial: this is particularly the case in the poorest countries with large rural populations. At times of emergency, remittance senders are often the first to respond. Remittance flows provide for the daily needs of families during natural disasters, economic hardships and times of political instability. 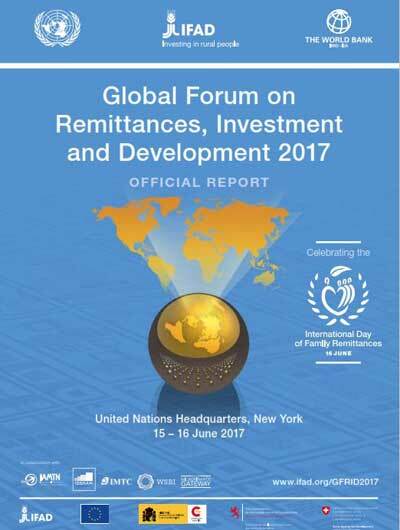 In order to discuss how to leverage remittances and help give migrants’ investments greater development impact, IFAD organizes the Global Forum on Remittances, Investment and Development (GFRID) every two years.